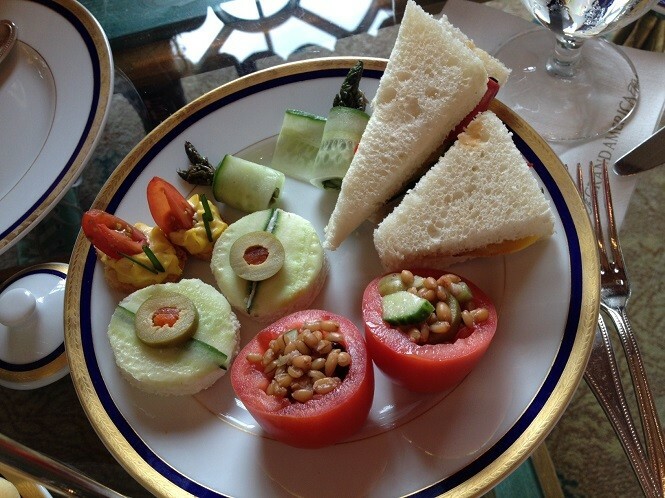 The Afternoon Tea service at The Grand America hotel is Salt Lake’s most elegant tradition. For $24 you can escape reality for an afternoon, enjoying the grandiose and opulent hotel while sipping tea and nibbling on tasty treats. Your table is beautifully set upon arrival, complete with a small serving of cream and berries to enjoy. As you take your seat in the Lobby Lounge, you’ll find a tea menu with plenty of options to chose from including green, black and caffeine-free. 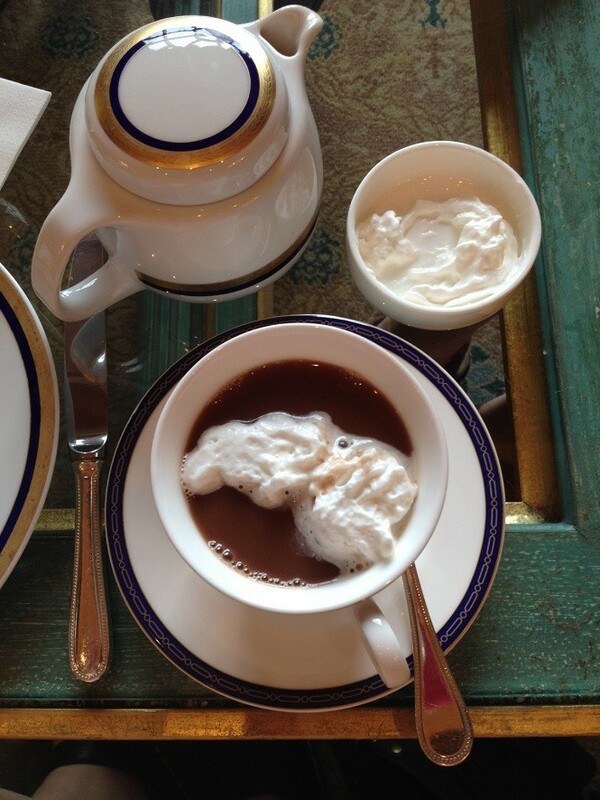 There’s even a selection of flavored hot chocolate served with fresh whipped cream. 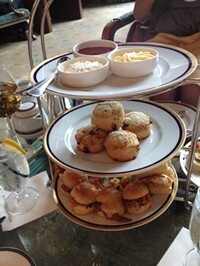 The first course is a collection of dainty sandwiches and mini scones. Each sandwich is a piece of art, made with painstaking detail. Delicate green cucumber slices adorned one sandwich, the tiniest amount of bright yellow egg salad, a quarter of a baby tomato and two slivers of chive decorated another. The scones were scrumptious with the addition of lemon curd, raspberry puree and whipped cream. I was partial to the lemon curd - it was perfectly tart and just sweet enough. There were audible gasps from our table when the dessert tray arrived - it was truly a sight to behold. The top layer was dotted with French jellies called Pate de Fruit. Bursting with real-fruit flavor, they were far superior to any candy that I’ve tried. The second plate was filled with madeleines, small cakes shaped like a sea shells, and tiny raspberry-filled butter cookies. The third plate boasted three of the most delectable, mind-blowing and picturesque treats. First of all, the Salted Caramel Macarons, a popular French cookie made from meringue, simply evaporate in your mouth with a hint of salty sweetness - these were my very favorite! 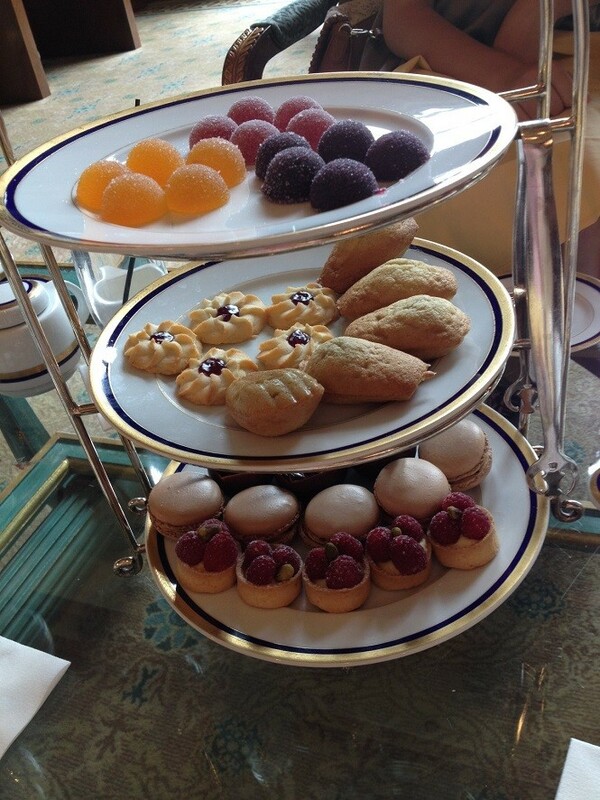 Adorable raspberry tarts with ripe raspberries were a pleasure with juicy, zingy raspberries and a single pistachio. The last treat was a dramatic chocolate shell filled chocolate mousse and topped with a single fresh blueberry and pretty chocolate leaf. “Whoever made these surely must have won an award,” quietly mused my 13-year old niece. The Afternoon Tea is something special whether you’re celebrating something special, or just need an indulgent afternoon pick-me-up. Of course, Afternoon Tea isn’t the only wonderful thing at The Grand America. Pop into their charming candy store, La Bonne Vie for gelato and macarons, or linger over fancy hand-crafted cocktails in the Gibson Lounge. The Grand America is truly a gem in our fair city.